A Microsoft acquisition and several user-interface faux pas haven’t stopped Skype for Mac 6.7 from continuing to be the go-to personal communication app for many OS X users. And why not? With a history on Apple’s desktop operating system that goes back nearly a decade, and a reputation for working well even under the most adverse conditions, Skype allows you to make cheap calls to traditional phone lines, and free ones—including one-on-one video and desktop sharing—to other Skype users. A few premium features have also started to creep into Skype’s functionality. In addition to paying a flat fee for unlimited calls to plain-old telephone lines, for example, you will also have to fork over a few bucks every month if you want to host video conferences with up to ten participants. Still, even the free version of Skype is more than enough for keeping in touch with your loved ones and business associates, regardless of where they are—or, thanks to the vast number of platforms supported by Skype’s underlying service, which kind of computer they use. 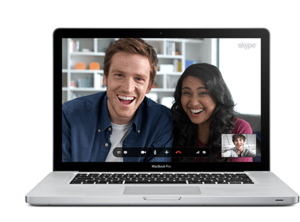 Despite the an interface that's unfriendly to Mac users, Skype is still the go-to app for communicating over the Internet.